On the Teleportaloo: Who doesn't love a baby elephant? Who doesn't love a baby elephant? The zoo was really empty last week. Lots of building work, but no rain. 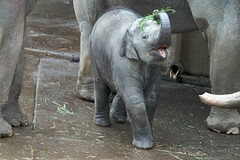 Samudra, the baby elephant was out playing with some Christmas Tree foliage. So cute!